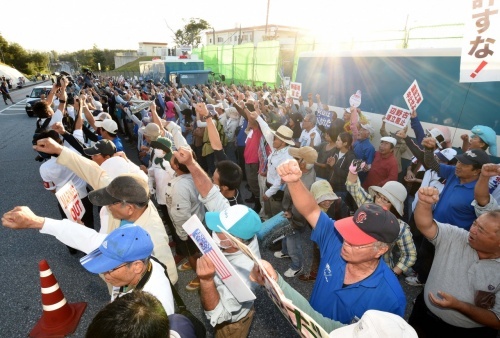 Citizens protesting against new base construction in Henoko gathered in front of U.S. Marine Camp Schwab’s gate, Henoko, Nago on the morning of November 18. A sit-in protest against construction of a new U.S. air base to replace U.S. Marine Corps Air Station Futenma in Ginowan marked 500 days on November 18. About 1,000 protesters, including prefectural council members, municipal assembly members, and those in citizen groups gathered in front U.S. Marine Camp Schwab’s gate. They staged a huge sit-in protest for three days. The participants formed groups to sit in front of the three gates of Camp Schwab and along the national highway. As of 9:45 a.m., anti-riot police officers from the Okinawa Prefectural Police and Tokyo Metropolitan Police Department had not shown up in front of the gate. And trucks loaded with construction materials did not enter the base. The protesters stated the anti-riot police officers could not show up in front of one thousand protesting citizens, and they all danced to celebrate. They continued their sit-in, cautious of trucks after spotting movement among the anti-riot police officers on the base. Workers employed by the bureau were carrying out work from three spud barges placed in Oura Bay. A drilling rod was installed in the water.